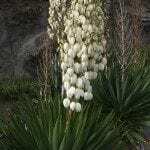 Came home and my blooming yucca has broken off at the trunk. It's hanging over. Can I save the part that's blooming? Not sure what to do. Yes, you can propagate from cuttings.